Loomis Driving School - Driver Training Lessons - Behind the wheel driving instruction. California requires a minimum of 6 hours of driver training lesson for new drivers under the age of 18. 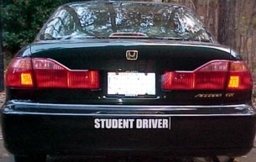 A DMV-licensed instructors will take you out for three lessons. Each lesson is two hours long and teaches the student different aspects of driving. The first lesson is driving on surface streets to cover the basic controls of the car and how to operate it safely. The second lesson is preferably after dark and expands upon the principles of the first lesson. The third lesson is primarily freeway driving: merging on and off freeways. Note about bad weather: Driving in bad weather for the first time is never fun but it's better to do it with a trained driving instructor in a car equipped with dual brake pedals. We can't control the weather but we think of it as an opportunity to teach extra skills if it's raining or foggy on the day of one of your lessons. We can teach some things that everyone should learn -- even in sunny California! You MUST have your learners permit with you for each lesson. You cannot drive with a photocopy or faxed copy of it. There are hundreds of driving schools located throughout California. Check our driving school directory to find one near you.